In recent years debates about the nature and future of the West have been high on the political agenda. Prognoses of the West’s imminent demise have been countered by those arguing for its continued relevance, or those arguing that while the West will survive its nature, and the balance of power between its constituent units, is transforming. This book argues that understanding contemporary developments requires subjecting the very idea of the West to critical scrutiny and in particular asking what kind of concept it actually is. 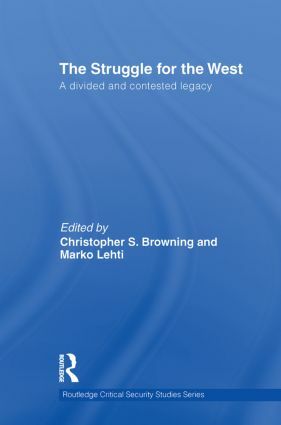 Locating the West as a discursive concept the book argues attempts to save, fix or reclaim the meaning of the West are illustrative of political agendas rather than indicative of accurate claims about the essential nature of the West. In contrast, the book argues that as a concept the West is impregnated with various discursive legacies, the most embedded of which are those of a civilisational, modern and political West. However, while attempts to define the West’s essence are therefore doomed to fail, given the concept’s historical and discursive flexibility, such attempts reaffirm the legitimising role which claims to the West continue to perform. Beyond this, the book challenges traditional genealogies of the West, which overwhelmingly depict the West as an inside-out concept. In contrast, the book argues that historically outsiders have played an important role in defining the nature of the West and constituting it as a political subject; processes that remain evident today. This book will particularly interest students of critical security studies, critical geopolitics, European politics, American politics and IR theory.